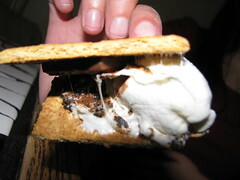 Check out Saving 4 My Family’s sweet Albertsons trip: Smores supplies for FREE! I tried to use both coupons (graham and all 3 combined) today and was denied. But still a great deal. I paired this s’mores deal with the Ritz crackers and free wheat thins and got it all for FREE! I also want to say Hi to Erika from Saving4MyFamily. I met her as she was going in and I was coming out. Thanks to her post, we have free s’mores for camping! I noticed that the $1 off coupon when you buy all 3 is actually $1 off the graham crackers as well. I guess if the cashier isn’t looking at it closely they wouldn’t notice, but I only used the one coupon making my total $2 which is still awesome.